Dedicated to teaching you how to surf! Starting out surfing at 11 in Daytona Beach, Ryan Ragan swept his first contest at age 14 and decided to make a career of it. He’s been competing and free surfing ever since, being featured in magazines and videos around the world. He now calls Daytona Beach, Florida his home. Now-a-days, Ryan spends much of his time spreading his knowledge and the love of his favorite sport. Ryan is the founder and owner of Vast Oceans Surf and SUP School. He teaches all types of age levels and skill levels. At Vast Oceans Surf & SUP School we offer the best Surf Lessons in Daytona Beach possible. We make learning to surf both fun and safe for everyone. Vast Ocean’s Daytona Beach surf school is conveniently located at Daytona Beaches #1 beach location and beach approach off of International Speedway BLVD. Stop by our surf school to discover your surfing adventure today! We’re dedicated to teaching you how to surf. If you want to learn surfing in Daytona Beach you’ve come to the right surf school. We have all the latest equipment. Be sure to visit our Frequently Asked Questions for Daytona Beach. Our Surf Lessons are Value Packed! Vast Ocean’s surf lessons in Daytona Beach are for people of all ages. In a 1 hour (easy to learn or improve) surf lesson, we teach you techniques for proper paddling, positioning, standing, falling, ocean awareness, getting through waves, wave timing and judgment skills. After the lesson, you may practice the skills you learned for one hour. If you need more time, you are welcome to return for follow-up surf lessons and/or surfboard rentals. At Vast Ocean’s Surf & SUP School we offer the best Surf Camps in Daytona Beach possible. We make learning to surf at our camps both fun and safe for everyone. Vast Ocean’s offers Daytona Beach surf camps on the beach at the International Speedway BLVD beach approach. Stop our school location to discover your surf camping adventure today! We’re dedicated to teaching you how to surf. If you want to join a learning to surf camp in Daytona Beach you’ve come to the right place. We have all the latest equipment. Be sure to visit our Frequently Asked Questions for Daytona Beach. Our Surf Camps are Value Packed! Vast Oceans surf camps in Daytona Beach are for people of all ages. We group students according to their ability using the buddy system. Campers enjoy the surfing instructor coaching and helping you catch the best waves. The instructors will teach you everything you need to know to have fun catching waves and surfing in Daytona Beach. By the end of our surfing camps, riders are surfing better than they ever have! At Vast Ocean’s Surf & SUP School we offer the best Stand Up Paddle Board Lessons in Daytona Beach possible. We make learning to SUP both fun and safe for everyone. Vast Ocean’s has a Daytona Beach surf school conveniently located next to the beach. Stop by our school location to discover your surfing adventure today! We’re dedicated to teaching you how to stand up paddle board! If you want to learn stand up paddle boarding in Daytona Beach then you’ve come to the right surf school. We have all the latest equipment. Be sure to visit our Frequently Asked Questions for Daytona Beach. Our SUP Lessons are Value Packed! Vast Oceans SUP lessons in Daytona Beach are for people of all ages. In a 1 hour (easy to learn or improve) SUP lesson, we teach you techniques for proper paddling, positioning, standing, falling, ocean awareness, getting through waves, wave timing and judgment skills. After the lesson, you may practice the skills you learned for one hour. If you need more time, you are welcome to return for follow-up SUP lessons and/or SUP board rentals. At Vast Oceans Surf and SUP School, we rent out the best Surf Equipment possible. We make learning to surf at our camps both fun and safe for everyone. Vast Oceans Surf and SUP School is located right in Daytona Beach. Stop by one of our school locations to discover what you are capable of today! 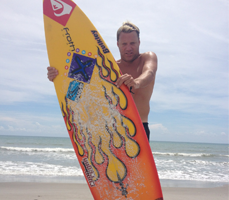 At Vast Oceans Surf & SUP School we offer the best Surf Rentals in Daytona Beach possible. We make learning to surf both fun and safe for everyone. Vast Oceans offers Daytona Beach surf rentals conveniently located at Daytona Beaches #1 beach approach. Stop by our school location to discover your surfing adventure today! We’re dedicated to helping you learn to surf. If you need to rent surf equipment in Daytona Beach then you’ve come to the right place. We have all the latest equipment. We carry a huge selection of surf rentals in Daytona Beach. With our friendly staff and experienced customer service we promise you’ll be stoked with your surfing rental.